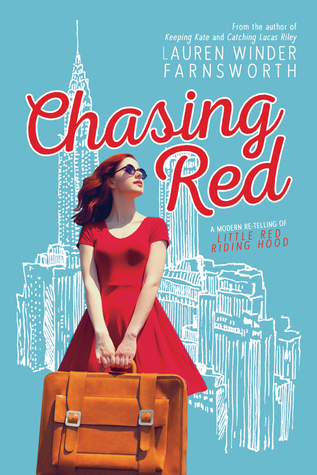 Ryder Redmond can’t wait to begin her new life in New York City, with her first real job after college. But the big city gets a little more complicated once she meets the charming and mysterious Damian Wolfe. On the surface he seems perfect, but her friend Hunter is suspicious of his all-too-straight smile and his motives towards Ryder. With her heart on the line, Ryder will have to decide just how much she trusts the handsome city slicker. Chasing Red is a very entertaining read. I was somewhat taken in by Damian and his charm (who wouldn't want to catch the attention of a gorgeous, successful man? ), but I did have some concerns about him. However, I'll be honest that right from the beginning I wanted Ryder to end up with Hunter. That wasn't even a focus, but he just seemed like such a nice guy and good office friend. I really liked Ryder's roommate, Lily. What a funny, quirky girl, who was really a blessing to Ryder. The relationship Ryder and her dad had was great and I liked how the story worked on repairing relationships that weren't so great. I'm glad Ryder held true to her convictions although I worried a few times. I didn't realize that this was a re-telling of Little Red Riding Hood before I read it. Seeing that on the cover now though (I don't really notice covers when I read eBooks) everything makes sense. I'm laughing at myself now when I type the characters names and see how they each fall into their roles. I loved the inclusion of accounting in this story. I just took business law and accounting classes, and it was fun to see aspects of those classes included in the story. Chasing Red is clean and a book I'd read again. I'm a little torn how to write this review. Let me just start by saying I loved this story, and by the end I was satisfied with how it all turned out and I didn't feel I wasted my time reading it. Oh, but during the reading I was filled with ... AH... moments! It wasn't a comfortable read for me. Not because there was anything inappropriate, but I just was anxious and wanting Ryder to make good choices and do good things, and it was just...AHHHH. I know, I'm not explaining it well. I was joking with my sister that I was filled with angst while reading this and I just can't read too many books like that. My body can't handle it :) However, I had calmed considerably by the end and I've already gone back and re-read the parts I liked. The cover says that this is a re-telling of Little Red Riding Hood. I love re-tellings. I'm not going to say that I recognized that this was a retelling though. Maybe I'm just not familiar enough with the Red Riding storyline, but it wasn't readily apparent to me. Looking back I suppose in one part of the story particularly I can see the fairy tale. It was just a little obscure...for me anyway. Source: We received eCopies in exchange for an honest review.